If profit maximization is considered the ultimate goal of a business, C-suite management may pursue unethical, immoral, illegal or even the corporation’s ultimate demise. In fact, we know this to be true. Consider the fate of corporations such as Adelphia, Enron, Global Crossing, Tyco and WorldCom. All held C-suite management singularly focused on profits, damn the torpedoes. So what happened to the share prices of those corporations? Then we have the accounting scandals of Waste Management, HealthSouth, Freddie Mac, AIG, Lehman Brothers, ad infinitum, ad nauseum. And lest we forget, our multinational banks and other financial institutions have also delivered insider trading cases, LIBOR rate fixing, foreclosure abuses, drug cartel and/or terrorist money laundering, or tax evasion assistance, all undertaken with the incentives of large bonuses dangling in front of the C-suite management, and the bonuses handed out when maximum profits were achieved. All told, shareholders lost billions holding stock in these companies. And this highlights another ugly reality: Friedman’s article helped launch the practice of incentivizing C-suite management to pursue profit maximization. 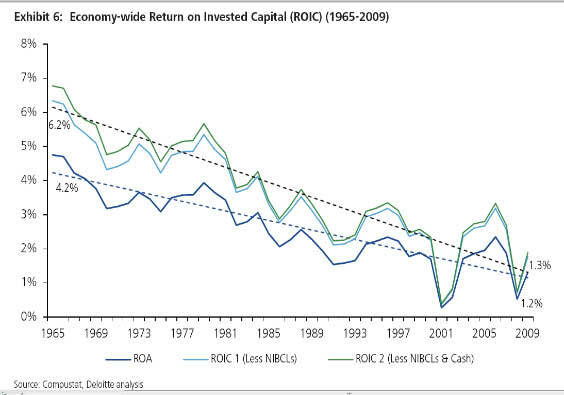 Yet, as the economy-wide return on invested capital declined from 4.2% in 1965 to 1.2% in 2009, CEO compensation doubled from 1980 to 1990, then quadrupled from 1990 to 2000. 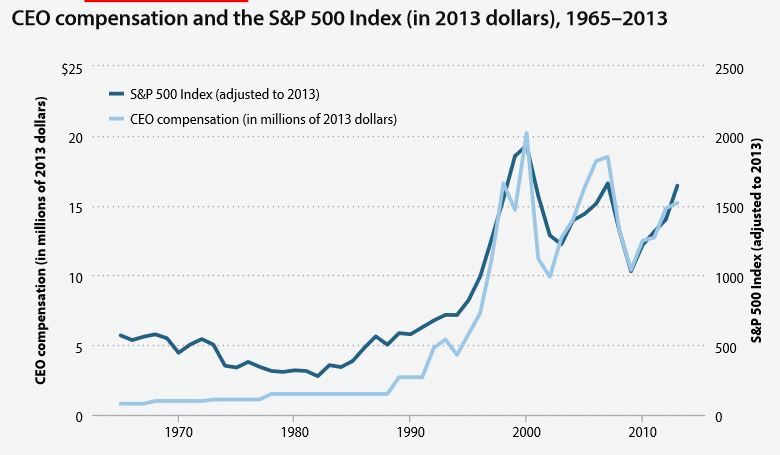 In other words, CEOs were richly rewarded compensation for a poorly done job. And then, of course, there was the mother of all negative externalities, the Global Financial Crisis of 2008, launched by a number of multinational and investment banks selling aggregated mortgages as investment, with subprime bombs hidden in the fine print. Save for Lehman, all of these banks remain, and their share prices have bounced back, thanks to massive taxpayer bailouts provided by the U.S. government. And yet, one could be easily forgiven for assuming the C-suite managements of Goldman, JPMorgan, etc., etc., have copies of Friedman’s Capitalism and Freedom or Ayn Rand novels tucked in their desk drawers. Bald-faced hypocrites. Privatizing gains while socializing losses. With the focus of profit maximization as an end, this also ignores the fact that no business can succeed indefinitely without the cooperation of labor, governments, customers or the community. Yet, with profit maximization, all these variables surrounding a business are largely excluded in its considerations. Corporations were able to keep their doors open, even flourish, during the “Humble Profits Era” of 1945 to 1970. Profit maximization also initiates the long-term rotting from within, as the C-suite management ignores the retention of valuable employees, research and development, internal training needs, trashing long-term investment opportunities since short-term profits are not there, or continuing to push profitable product lines while ignoring the upstart competitor’s offerings of the next big thing. In short, profit maximization is self annihilation. Profit maximization as an end in a business is so hyperbolic, it even surges past self-interest, a narcissist’s ultimate narcissism, if you will. At the micro level, businesses begin to implode. At the macro level, our form of centralized capitalism starts to eat itself. And the customer, for those C-suite managers with highly-bounded thinking capacities thus unable to connect the dots, is some other business’ employee. If that business offshores its jobs, and your business offshores jobs, then there are fewer and fewer domestic jobs remaining, which translates to fewer paychecks or declining household incomes in the aggregate, which translates to fewer and fewer customers for all businesses, which translates to fewer and fewer profitable quarters. Capitalism was highly decentralized, with most businesses operating at a local level, and the health of the local economy was highly critical to the success of all businesses within that locality. This set up immediate feedback loops, helping business owners to quickly adapt to shifting realities, or close its doors. Thanks to the decentralized nature of capitalism, it hosted numerous small markets in any given nation in which capitalism was emerging. Not only did customers have choices in products and services, but small business owners had choices in markets in which to operate. Alas, the transportation technologies of the time hindered taking full advantage of this reality. Due to the local nature of capitalism, customers largely served in the capacity of regulators. Bakers who baked cockroaches into their bread loaves were not destined to survive. Decentralized capitalism was more about effectiveness than efficiency. Communities understood jobs were necessary for as many members of the community as possible, so that the overall health of the community remained intact. Decentralized capitalism was largely supported by self employment. In 1776, some 87% of the population within the American colonies was self-employed. This conveyed a sense of dignity for most, as their destiny and lives were largely controlled by their own efforts, not the foibles and whimsies of C-suite management focusing on profit maximization. While both pro- and anti-capitalist voices heatedly debate the survival prospects of capitalism, both sides are guilty of assuming the highly centralized capitalism of today was or will be the only reality. Yet, it was the decentralized nature of capitalism in its early years that allowed it to flourish, while the overly efficient and the underly effective nature of centralized capitalism – with its drive for profit maximization – is pushing capitalism to its demise. In fact, centralized capitalism is a completely different set of stripes for the zebra, one that does not allow it to become part of the surrounding ecosystem. The first individual – or Adam, to use John Locke’s example in this argument so abbreviated as to perhaps do it an injustice – held natural rights, i.e., the rights to life, liberty and the pursuit of happiness. Since natural rights are immutable, intrinsic and inalienable to the individual, natural rights could not have been granted by governmental decree since these rights existed prior to the emergence of government. And with the arrival of Eve (continuing with Locke’s examples), society was established. Thus both the individual and society preceded governmental institutions. Adam and Eve also possessed a conscience, and the (properly functioning) conscience regulates the individual’s use of his or her natural rights so as not to infringe upon the natural rights of others, i.e., taking license. Of course, not everyone possesses a properly functioning conscience, so government emerged to regulate the public disputes between individuals. But on what grounds was that government established? Since the individual-now-citizen (of a society) possessed natural rights and a conscience prior to government’s emergence, the citizenry held the sovereignty of a society, thus allowing them to bestow limited powers to government for the proper regulation of that society. What Locke took for granted was the decentralized nature of the economy in his day, but this does not negate the equally credible argument that both the individual and society predated economic institutions as well. Thus, both governmental and economic institutions are there to serve the individual, functioning as a citizen of a given society, and thus governmental and economic institutions should serve society. Today, both the individual and society serve our heavily centralized, bureaucratized, massively ineffective, inept and corrupt governmental and economic institutions. In essence, we now live in Wonderland, where everything is twisted upside down. But if business owners, C-suite management and shareholders want to ensure the long-term viability of their firms, they better damn well start placing the needs of the ecosystem in which they operate ahead of their own short-term greed. Build a business with a focus on the health of the ecosystem in which it operates, and the profits will come without the need for an obsessive focus on profit maximization. Always harder to argue for the non-consideration of our greater economy when a key founder of the U.S. asks us to consider otherwise.